Many people feel they can save on sales tax by purchasing our goods out of state. These savings can sometimes represent hundreds of dollars that can more than offset shipping costs from far away vendors. While this appears to be a winning strategy for saving money, this is not always true. When making your purchasing decisions, we ask you to please consider the two points before you purchasing out of state. More often than not, EAR can easily beat an out-of-state price INCLUDING THE TAX SAVINGS. All we ask is to let us give you our competitive quote and we just might offer you some overall savings even though you’ll be paying sales tax. We love a challenge! It’s worth a try? You are contributing to the local industry as well as city and state economies. Buying locally establishes more of a community environment whereby customers and retailers/vendors are supporting one another and can benefit greatly by helping each other succeed. Loyalty is a 2 way street and our company loves to help out those customers that support us by offering you free loaners, rush shipping, extra technical help, etc. whenever we can. Arizona’s businesses, state and city governments need your business now more than ever. 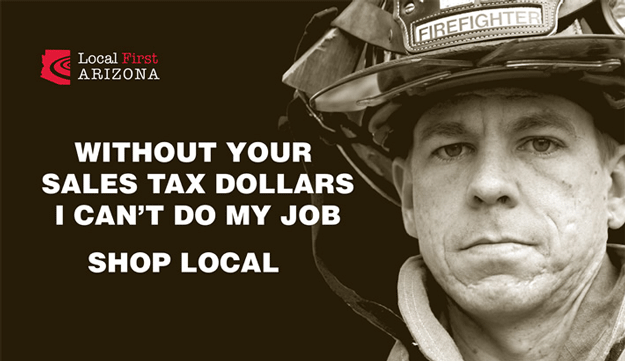 No one expects you to pay considerably more for buying local, but keeping the purchases in the state will eventually help everyone in the form of a more robust local economy and lessen the need to raise taxes of all kinds including sales and income taxes. Obviously, customers want to get the best possible deal with their purchase. When you purchase from EAR, we believe you will be getting the best value all the way around, including price, help nurture our economy, and establish better local relationships, all at the same time. Win-win! Contact us today and find out how you can save money on your future purchases – and help your local community. Visit Local First Arizona on the web to find out how change starts locally.